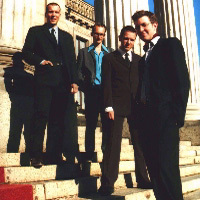 Brideshead formed in spring 1993 in Wiesbaden/Germany. But their initially chosen name Starfish was dropped before their first release in 1995. Various lineup changes came to happen before their current lineup is a steady one since end of 1997 with five members from Wiesbaden and Frankfurt. Their album was recorded in 1998 and a great u.s. tour took place in 1999. Their music can be described as guitarpop, but not with regard to the charts, rather in the vein of the great eighties guitar pop bands. sebastian and charles were lying under this wonderful tree in their white suits and the golden summer sun is glittering through the leafage. the two oxford students are drinking champagne and eating strawberries. in this perfect moment they’ve got a feeling that their friendship and this summer will never end and that they could lay in the grass or in the sun on the roof of brideshead castle forever and ever - celebrating their youth. this is a scene from evelyn waugh’s classical novel brideshead revisited. it describes one of these rare and special moments that should last forever. Five young students got so much impressed by this spirit of the TV series with the same name in their early teens (and later by the book in their early twens) that they called their P!O!P! band “brideshead”. combining the best in P!O!P! e. g. the summer of 82’ (with bands like orange juice and lloyd cole), the class of 86’ (mighty mighty, mc carthy or bodines) and the freshness of swedish P!O!P! 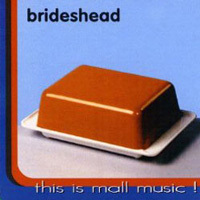 in the 90’ (eggstone, cardigans) brideshead released since 1995 the ep “this is mall music” (the first record on apricot records), their album “some people have all the fun” (on marsh marigold) and several 7” vinyl singles. their new album contains completely new tracks, unreleased songs and tracks for the first time on cd from their vinyl singles (released on the us label shelflife records, the german marsh marigold and apricot records). this record gives you an overview over the last 7 years of brideshead’s music – till today: brideshead revisited. let us invite you to a bath of jangly guitars, timeless melodies and a gentle voice by a band once called the best english-vocal-band currently around in germany. german guitar pop with english lyrics that brings to mind the best of mid 80's guitar pop. 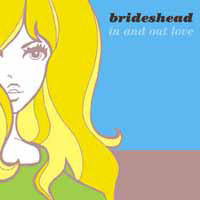 first release of brideshead ...- nowadays already a guitar-P!O!P! classic. 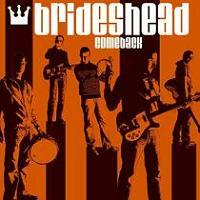 the comeback from brideshead celebrates four new songs from the guitar pop band. now with their new drummer burkhard, the band was recently recording four tunes, with influences from swedpop to 80s pop - well, brideshead at its best.